Sudi was a Redguard citizen whose family got more than they bargained for when they bought Frostflow Lighthouse. When she started hearing strange scratching noises from the basement her father Habd left for town to buy traps believing they had a skeever infestation. It turned out to be far worse though as Falmer and chaurus tunneled in through the cellar from Frostflow Abyss. They killed her mother Ramati, dragging her brother Mani and herself into their lair. The Falmer soon killed Mani, while keeping her captive to feed their brooding chaurus reaper. After returning home, Habd chased after his children and was captured as well after succumbing to a poisonous chaurus bite. His final fatherly act was to give his daughter a dagger before being dragged away to be eaten. Sudi took the dagger as a means to escape and killed herself before she too could be eaten alive. Her corpse can be found still behind bars and lying atop a scrawled page and a bloodstained note. She can be found wearing some farm clothes along with a pair of boots. 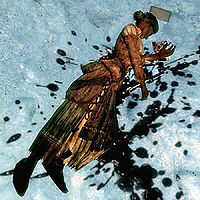 Her journal can be found in her and Mani's room, detailing her life prior to the massacre.